Diane, I'm so sorry to hear of your husband's condition. I was there approx. 3 1/2 yrs ago with mine and I know how difficult it is. I have so enjoyed your monthly calendars and will miss them but I know that's a very low priority right now. Take good care of yourself and your hubby and thank you so much for all the lovely monthly calendars. Prayers for you. Sorry to hear. I guess I will have to go find another source for my desktop calendar. Thanks. Diane, Take care of yourself! Being a caregiver takes a toll. Prayers for you & your family. 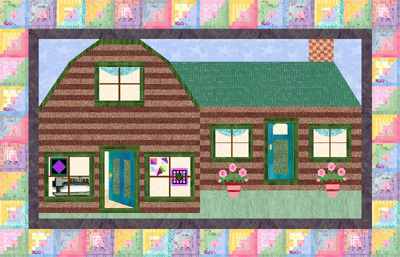 Quirky Quiltaholics will look forward to seeing you again in Feb. Thank you for all the pleasure you have shared with the calendars over the years. You are right to put other things first right now. Diane, I hope that 2016 brings a better year for you. Take care and I'll see you in February and again in April. I have really enjoyed your calendar and I will miss it very much (and my students will, who saw it on my computer when I was starting a presentation) but instead of whining too much, I just whant to thank you for all the Work, thay you have put into it through the years. I hope that things will change for the better for you and your husband - once Again thant you very much! My prayers are with you and your husband now. I lost mine 15 months ago and know very well those feelings of being overwhelmed. Good for you for setting your priorities, taking care of your husband and yourself. I have used and loved your calendars for a very long time. Please know your efforts are appreciated. Good for you Diane! You know I'm praying for relief for y'all in 2016 in whatever fashion the Lord provides. I will miss your monthly calendars (it's like having Diane right *here* with me!) but the time and effort it takes to design them every month is a burden. When something's gotta give, you have to go for the low-hanging fruit. I pray you'll have moments every now and then to vent here on your blog! Much love, ginormous hugs and earnest prayers for all of you.